The BJP’s stance on the Sabarimala issue echoes the larger sentiments of the people of Kerala. Their chances of reaping its benefits in the Lok Sabha election seem rather high. Here’s how their chants of Saranam Ayyappa seems to be paying dividends. In the run up to the elections, the Sabarimala entry issue was the most emotive one in Kerala. Opinions were markedly different across the political divide. The Leftists, who profess to be atheists, went hammer and tongs on an issue that basically pertained to the Hindu belief system. But to be fair, as the government of the State, the Left Front had to do all it could to implement what was essentially a court order. If the Left Front had merely stuck to the task of upholding the court's diktats (by providing security to women wanting to enter the Sabarimala shrine) it may have been fine. But when some of its own women cadres, posing as devotees, were foisted in the area, it became an act of provocation in what was already a surcharged atmosphere. The BJP, too, ran a controversial campaign, amplifying the larger sentiments of the temple-going public in the State. 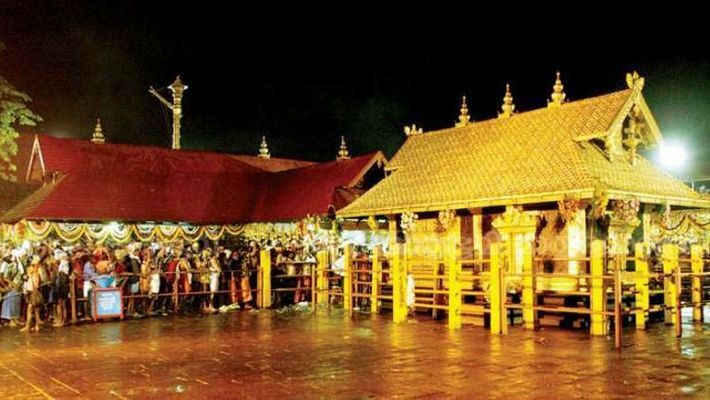 Irrespective of the merits of the court verdict allowing menstruating women to enter the Sabarimala Ayyappa temple, overturning what is taken to be a centuries-old tradition of the temple's premises being open only for men, the general mood in the State (especially among the Hindus) was that it was a matter of faith and personal belief, and temple rules and rites are better off left untouched by the State. .Kerala Nairs and tribals, who have connections with the Ayyappa temple, felt alienated by the court verdict and the state government's overzealousness in the matter. The BJP and the right-winger’s gambit took off from the combative mood among the majority of the public on the Sabarimala matter. Caught between the Left and the Right, the Congress was as ever wishy-washy. It understood the feelings of the people. But it could not say it in as many words because that would have meant toeing the BJP line. On the other hand, it could ill-afford to back the Left Front government on this issue because that would make it seem silly in the eyes of the public. The local leaders of the Congress were singing a different tune to that of the party's Delhi hands. It was quite evident that the Congress was mired in confusion. With so many events transpiring over the temple issue, there was, inevitably, plenty of curious eyes peeled for the Pathanamthitta constituency in whose snug ambit is the Sabarimala hill shrine. Going by the general mood in the area, it seems that the BJP is all set to open its account in the State for the first time. As per indications available, its candidate K Surendran looks to be in the driver's seat. Reflecting the trend, Kerala Janapaksham Party led by the independent MLA of Poonjar, PC George, formally joined the NDA yesterday. George, a former Kerala Congress leader, is said to have good hold in Poonjar and Kanjirappally Assembly segments that have a sizable chunk of Christian population. Of course, Surendran, who kind of spearheaded the Sabarimala protests on behalf of the BJP, is himself a seasoned campaigner and is a popular leader in the area. The fact the Nair Service Society seems to be obliquely backing him makes his corner stronger. For the record, the Nair Service Society (NSS), which was involved in the Sabarimala protests, is keeping itself away from all the three main players. But its stand on the Ayyappa temple issue makes it closer to the BJP. The tribals, in the area who feel spiritually connected to the Ayyappa temple, have also lent their support to the BJP. Surendran, by all accounts, is running a smart campaign by not harping too much on the Sabarimala temple issue, but focusing more on infrastructure problems in the constituency, and also the poor relief operations in the area after the floods of last year. The constituency, which generally witnesses two-cornered fights, is now faced with a three-pronged battle with the BJP up against the LDF and the UDF. The CPI-M has gone for Veena George while the Congress has chosen Anto Antony, the sitting MP from the constituency. Anto Antony is a strong candidate, but the issues ranged against him and the multitude of factors at play make his position vulnerable. If the BJP indeed wins from Pathanamthitta, it would mean that its fervent cries of Swamiye Saranam Ayyappa would have paid dividends.